To change the button in the configuration panel from "Show profiles" to "List Users". * Note, Jomres currently comes with 24 language files by default. These files are contributed back to the project by users of the software and as a result, apart from the English language files, they are invariably in different states of translation. This means that most of the non-English files will have some or many definitions which are still in their English form and it is the responsibility of the purchaser to ensure that the language file for their chosen language/languages suits their needs. There are quite a lot of language definitions in Jomres, somewhere in the region of 2000+. New language definitions are always added to the end of the language files which makes it easy for users who have upgraded to add their own definitions to the end of the file. If you edit the language files, then obviously you'll need to back up your customised language files before you upgrade. Existing Jomres language strings will have been overwritten if they are part of the core languages. If you then use the upgraded version of Jomres and use a new feature or configuration area, you might see something like the string '_JOMRES_COM_MR_LISTTARIFF_TITLE' instead of where you would expect to see a label (eg "Tariffs"). This is because the new version of the Jomres language file has definitions that your 'old' version does not, which is why it's best, when upgrading, to compare your customised language file with the core Jomres one and copy the new definitions from the core Jomres file to your customised file before replacing the core with the customised files. You need to be careful when editing language files. A common problem is where French language users (who commonly use the ' (single quote) accidently introduce errors such as the following (My French is terrible, so translation examples will be in English). The above string will cause a fatal error within PHP because the ' after the "p" has cut short the string to "Show p" and PHP cannot parse the "rofiles" afterwards in a meaningful way. If you find yourself creating this problem, there are two ways to rewrite the line to make it work correctly. You could either wrap the entire string in " (double quotes) or escape the single quote using the \ symbol. Following are both working examples. We don't have the resources to ensure that all of the language files are translated for each and every version of Jomres that's released, which is why some files have been translated more than others. The non-English language files have been contributed by various members of the Jomres community over the years, and we rely on existing members contributing their versions of the language files back to the project. 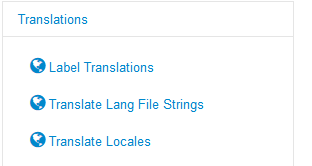 If you'd like to contribute a translated file back to the project, that's great. It means that your translation will appear in the next version of Jomres (meaning there's less hassle for you when you upgrade) and other users will benefit from your work. The only thing we ask is that you sign the copyright of the translation over to Woollyinwales IT so that we can ensure that we can continue using the translation in the future.